Photo 1. Concrete sleepersTradionally sleepers (ties) have been wood, usually hardwood, but there are a number of reasons to consider alternate materials. Sleepers made from recycled plastic have also been used successfully, but other materials can be used too. In particular concrete is used increasingly in full size practice, and there is no reason why these techniques cannot be used in miniature railways. Building track is hard work! And once is has been done you do not want to spend all your time doing track maitenance and the expense of operating trains. And there are ways to minmimise maintenance. Some of the more important ways have to be taken into account when first building the track. Materials: Untreated wood usually has a poor life span. Suitable hardwoods, woods soaked in oil or creosote (now banned), and pressure treated woods will all eventually rot, and softwoods rot very quickly. Wood has less than about 7-10 years expected life, with some hardwoods reaching 15 years. Concrete goes a long way to extending life span (and reducung the amount of maintenance) for a much longer period. Concrete sleepers have a very long life. Once they are used, future maintenance is reduced to very low levels, and probably won't have to be replaced within the lifetime of a railway. This equals more time running trains and less on mainenance. After the basic design and dimensions of the sleeper is decided, you need to make a metal mould. 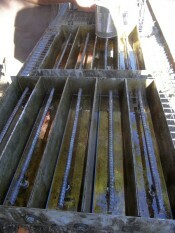 A mould can be made from 3mm galvanised steel plate. In the photos from Walka Miniature Railway, they used moulds with 4 or 5 partitions, and made enough moulds to produce around 20 sleepers per concrete pouring. The mould manufacture was sub-contracted to the local sheet metal company. NOTE:- It is very important that only hot dipped galvaised bolts and nuts are used to ensure maximum lifetime! If you use indoor grade zinc plated bolts, they will rust very quickly (<1~2 years) and dramatically shorten the lifetime defeating the purpose of using concrete in the first place, and make the nuts impossible to remove. Use hot dipped galvanised nuts and bolts only. The reo assembly is bolted into the mould. The rail securing bolts are used to position and hold the assembly in place during pouring, and the nuts seal the holes to prevent leakage of the wet concrete. VERY IMPORTANT:- It is very important that a release agent be painted onto the mould internal surfaces prior to pouring, otherwise you may never get the completed sleeper out. Use plenty of used sump oil applied liberally with a brush! Drawing 3. Completed sleeper with rail bolted in place. The photo below show the production process from raw materials to completed sleepers. Click on photo to enlarge. Photo 2. Reo assy before welding. Photo 3. Welding jig for reo assy. Photo 4. Reo assy awaiting fitting to mould. Photo 5. Applying release agent (sump oil) to mouds. Photo 6. Mould ready for pouring. Photo 7. Pouring concrete into moulds. Photo 8. Waiting for concrete to set. Photo 9. Moulding and storage area. Photo 10. Removal from mould. Photo 11. Removal from mould. Photo 12. Stockpiling completed sleepers. Photo 13. Completed sleepers installed at last. Photo 14. Some completed trackwork. Photo 15. Some completed trackwork. Photo 16. Enjoying the results. Cost is always an important factor. Sleepers made from concrete are bit more expensive than timber - but this has to be traded against much longer life and reduced maintenance. The cost [as at Apr 2013] of concrete sleepers 75mm x 80mm x 500mm long is a bit less than $2.00 each. (including sand, cement, gravel, reo, nuts/bolts, welding etc). This assumes batch production. By comparison, sleepers made from new CCA treated pine are approx $1.20 each for 50x50x500 (in bulk lengths, not cut to size). Hardwood is a bit more expensive. The fire resistance of concrete sleepers is outstanding - they do not burn! This article is based on information supplied by Walka Miniature Railway, Maitland, NSW and is used with permission. All photographs from Walka Miniature Railway unless otherwise noted. 814 Text and photos Copyright © 2006-2019 SMEX, All rights reserved.